The high temperatures in Chiapas did nothing to slow down Daniel Suárez on Sunday in NASCAR Mexico Toyota Series action. Suárez was the first to complete the 200-lap RedCo 240 Km at the Súper Óvalo Chiapas, crossing the line in two hours, 28 minutes and 10.236 seconds on a day when the thermometer eclipsed the 95-degree Fahrenheit mark. The 22-year-old NASCAR Next driver, who qualified 11th for the event, kept himself in the hunt for the lead throughout the first half of the race, getting his first taste of the top spot on lap 81, passing then race leader Antonio Pérez with a strong inside move. Suárez ceded the top spot to Elliott Van Rankin at the halfway point as race leaders headed to pit road. On lap 124, Suárez regained the lead and would hold on for the remainder of the afternoon en route to his second Toyota Series victory of the year and seventh of his career. Pérez and José Luis Ramírez, both drivers for TELMEX, crossed the line behind Suárez, finishing second and third respectively. Patrick Goeters and Héctor Aguirre rounded out the top five. Rafael Martínez, Rodrigo Peralta, Rubén Pardo, Abraham Calderón and Rubén García Jr. complete the top 10. Sunday's victory was Suárez's fourth NASCAR series win of the year. 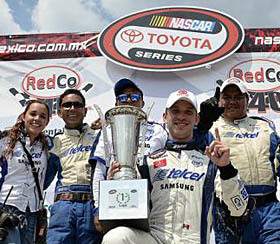 The Monterrey, Mexico, native opened 2014 with back-to-back wins in the NASCAR K&N Pro Series East where he races with Rev Racing as a member of the Drive for Diversity program. He also won the season-opening Toyota Series event in Phoenix International Raceway prior to Sunday's victory. Suárez has now won three of his previous four Toyota Series events, dating back to last season and five of his last eight NASCAR races overall. The NASCAR Mexico Toyota Series returns to action in two weeks, as the series heads north to Monterrey for the fifth event on the 15-race calendar.